Jane Austen's World has written a very interesting post about footmen in the Regency Era. What were their duties and what was their life like? 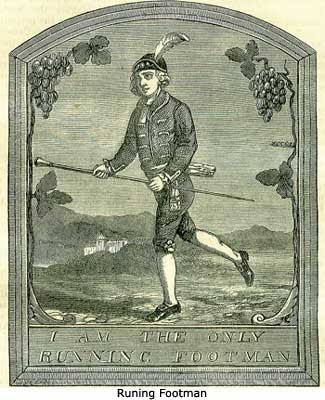 Footmen acquired their names from their running duties, accompanying their masters or mistresses alongside carriages or horses. They carried a long cane containing a mixture of eggs and white wine for sustenance, but many accounts talk of thin, gaunt footmen who became too old before their time. By the 18th century, footmen began to work under the supervision of a butler, taking on such duties as “carrying coals up to rooms, cleaning boots, trimming lamps, laying the table for meals, answering the front door and, at Erddig, sleeping in the butler’s pantry to ensure nobody stole the family silver” (Willes, page 18). The footman’s life was not an easy one. He arose at the crack of dawn and worked until 11 p.m. at night almost without pause. Historical Reads: Jane The Meek And Mild One?